I needed a page for pictures that weren't really associated with anything but Boise, so I put one in. 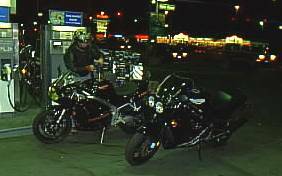 This is a quick snapshot of Larry D and I at the gas station on the way downtown. Notice the "old and new" theme; he has a new Triumph T595. Not much else right now, so it's back to the top.